Not sure of the cause, but it looks like Windows Defender for Win7 is broken. Details on Günter Born’s Borncity blog. UPDATE: Vess Bontchev confirms and Kevin Beaumont says he’s bringing in the Windows Defender Security unit. We are having a slight problem… or rather they are. East Coast and West Coast are impacted. This month’s patches contained a few surprises and some significant bugs, but they were largely fixed around the end of June. The big problem: Despite Microsoft’s assurances, Windows 10 1803 isn’t ready for prime time. Full article in Computerworld Woody on Windows. So what, exactly, is the new KB 4315567 “Compatibility update for upgrading to Windows 10 version 1803”? Supposedly it’s for Win10 1803 Enterprise. Which doesn’t make a whole lot of sense — a KB for Win10 1803 Enterprise that makes it easier to upgrade to Win10 1803 Enterprise? Pshaw. The update isn’t available from the Catalog. We’ve had “compatibility updates” in the past, including KB 2952664 and KB 2976978, but they just increased telemetry in Win7 and 8.1, respectively. Unless you wanted to upgrade your Win7 or 8.1 system to Win10, they were useless. Worse than useless, because they increased Microsoft’s snooping. Thx to Richard Hay, @WinObs. Susan’s post below talks about the KB 4284848 second June cumulative update for Win10 1803. There’s also a “critical” Servicing Stack update for 1803, KB 4338853. SMBv1 fix – Addresses an issue where some users may receive an error when accessing files or running programs from a shared folder using the SMBv1 protocol. The error is “An invalid argument was supplied”. RDP window fix – Addresses issues with the Remote Desktop client in which pop-up windows and drop-down menus don’t appear and right-clicking doesn’t work properly. These issues occur when using remote applications. Mind you on that second one vendors were having you hack up and put in 1709 RDP files as a workaround to get RDP – especially windowing to work. 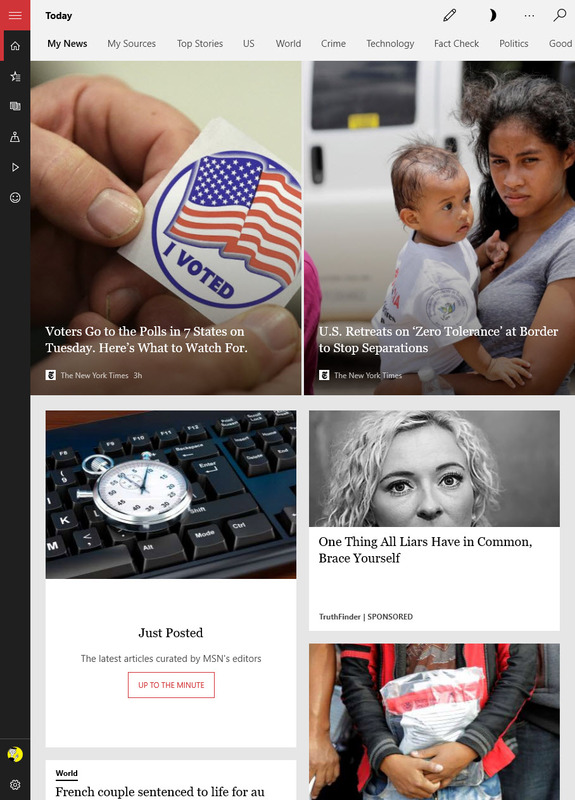 New Win10 News app vs. Google News page – which do you prefer? I don’t claim to be an expert at web page layouts, or news content curation, so I’ll just post these screenshots and let you decide. First is the new Windows News app, which only runs on Windows 10. 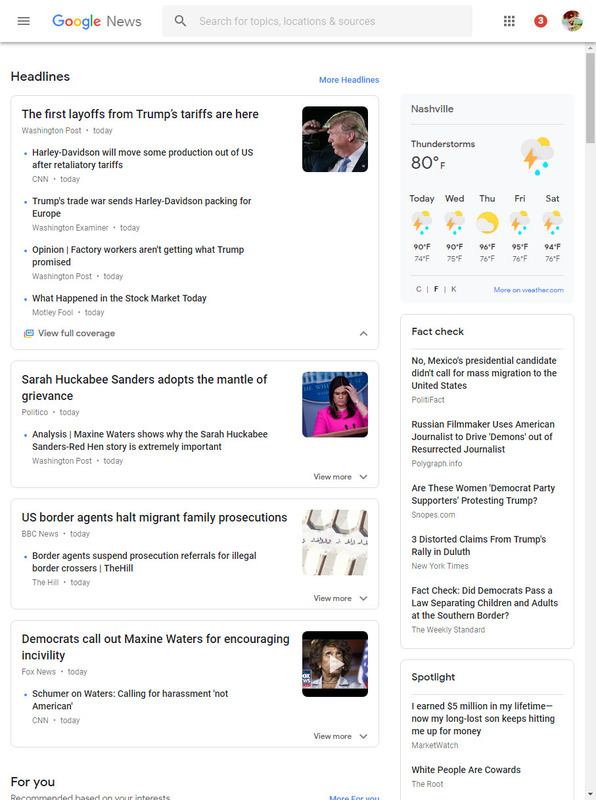 Google News is available on any device that can get to the internet.